Other than Vinyl Toupee, which is not mine, these are the dates of the ones that I have that are opened... I have more of the N2O Cola and Sidewall Shine promo Cars but they are in sealed baggies in the TRU display cases with solid black bottoms. 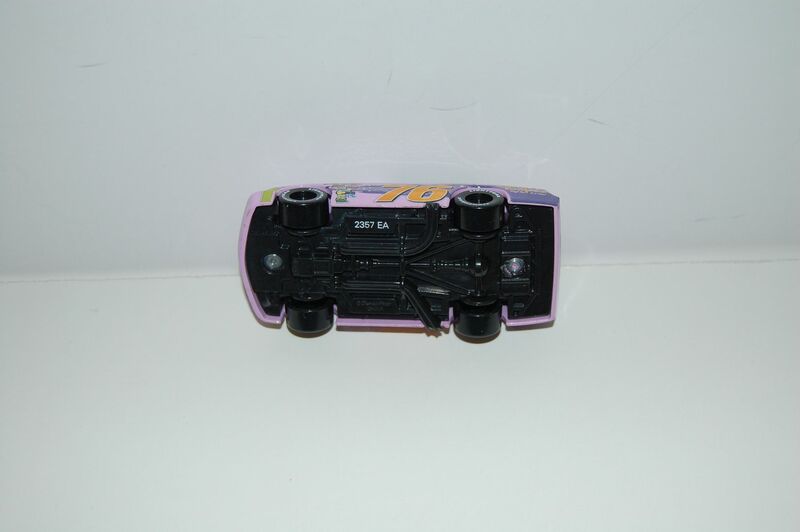 We've had a couple of people ask about production codes on the bottom of Mattel's Cars... Sometimes those of us who have been collecting for awhile forget that those of you who have just recently started collecting may not know what they mean... Anyway, here's a few examples that will show how to interpret them.... I'll add pictures later. Cars are marked with a code on the bottom of the Car.... there are 4 numbers, then 2 or 3 letters... and some Cars have an M.I. as well. the production code is 2357 EA... The 2357 means the Car was produced on the 235th day of the year 2007... If I did the math right, that means the day was August 24, 2007... the EA is the abbreviation for the factory that produced the Car. UK Promo Car - 2357 EA - produced the 235th day of 2007 at the EA factory; August 24, 2007. The original 36 Cars produced in the Speedway of the South set have certain codes... I'll be taking photos of mine eventually (the codes are posted on carsthetoys.com)... A less than honest seller might try to tell you that they are selling a Vinyl Toupee from the Speedway of the South set... but if the production code is 2090 EAA you know that it was made in 2010 and not 2007... 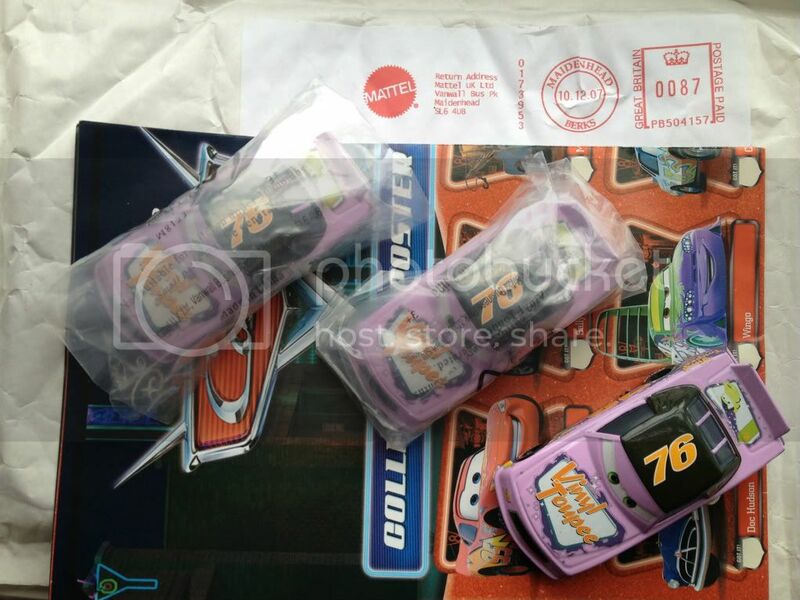 Even if the Car from 2010 comes to you in the official Promo baggie, it's not the Promo Car. 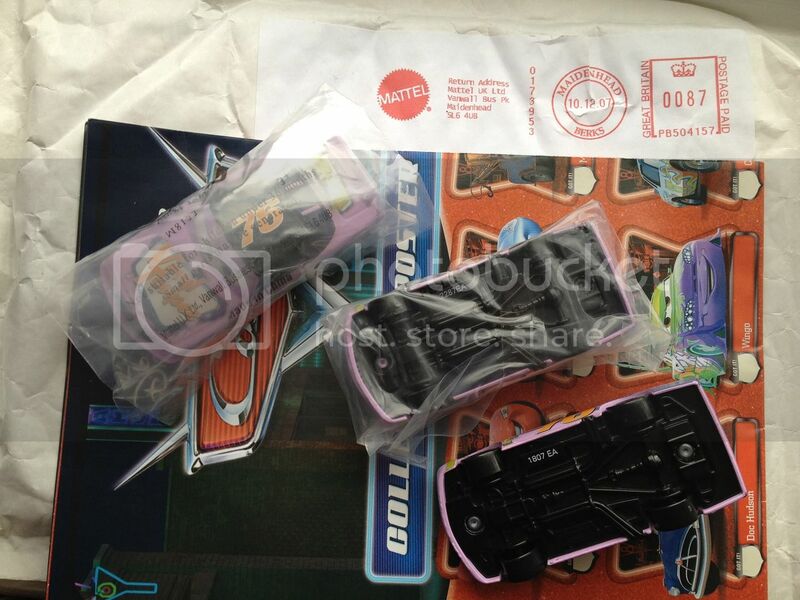 In my opinion, the Vinyl Toupee from the UK Promo is a nicer looking Car than the Lightyear Launcher; but to most people, you won't notice a significant difference... and if you bought them for a child or grandchild to play with, then it's perfectly OK.
What does it mean if a Car has no production code stamped on the bottom of the Car? - it means the Car is more than likely one that was produced at the factory but either rejected (could have quality issues) or given to or taken by someone at the factory... sometimes these are unauthorized productions at the factory... sometimes these are prototypes - early releases of Cars... 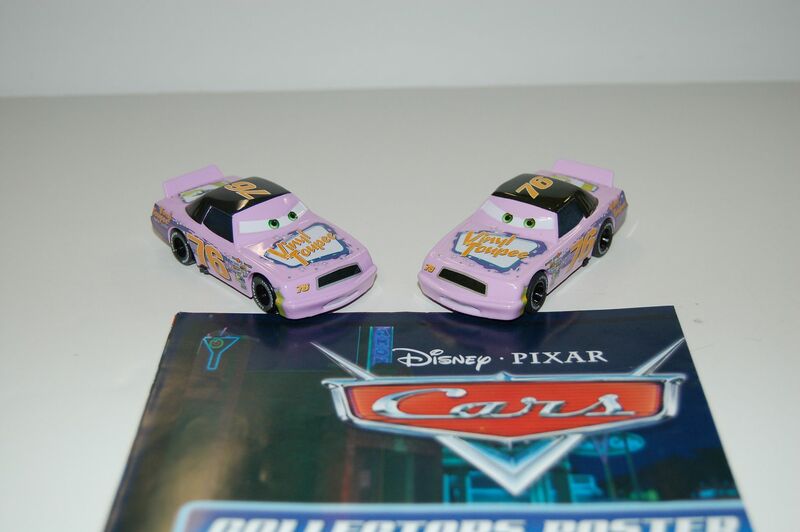 There are also a few counterfeit Cars that have been made. 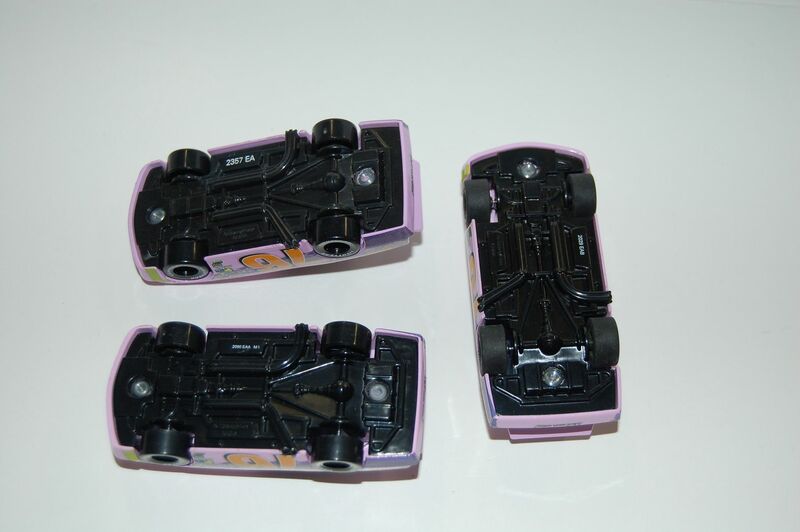 Cars diecasts have been made in Thailand and in China; China has been the exclusive manufacturer for quite a while now. 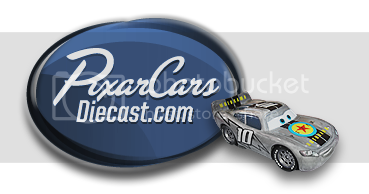 So when carscrazy posted about their Vinyl Toupee having a code of 3010EAA M.I, it means it was produced during the Lightyear Launcher production and not from the Speedway of the South set or the UK Promo. If you have any questions about production codes, feel free to post in this thread... I'll add more later... Thank you. Last edited by cac1959; 03-14-2012, 09:07 PM. This is a fantastic thread for people like me who are just learning about all the variations of released cars eg promo,launchers etc. when i get the promo from germany/italy, i will post dates chirs. can someone explain the numbers to me, do they mean some are rarer than others or something? The first 3 numbers represent the day in which they were made,the last number represents the year. So if the number reads 1308EA,it was made on the 130 th day of 2008. Sometimes the numbers can confirm if the car is authentic or not,like the speedway of the south set cars or the promo cars which were only made on certain dates. What is the code for Final Lap Dexter??? 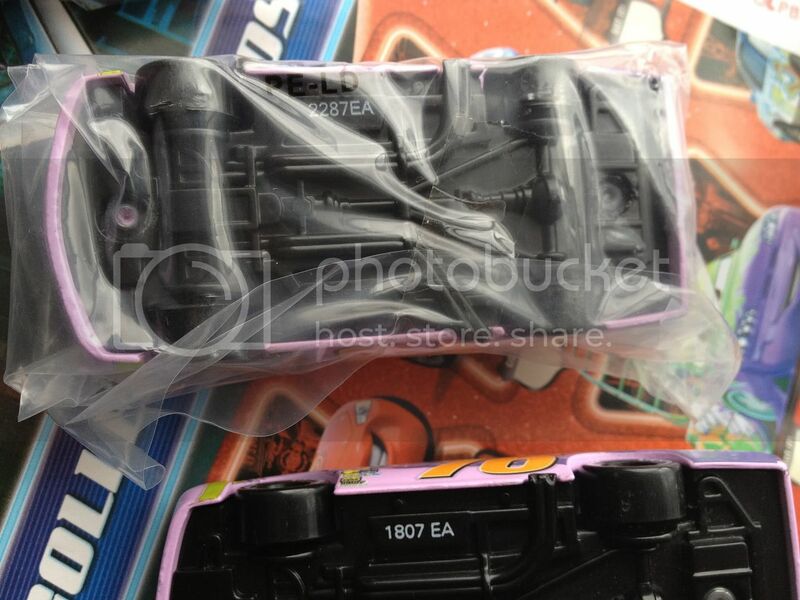 I think I got one in my 2014 package cause the eyes / mouth / bed of the truck are plastic.